Rubiks Cubes! I cant solve them to completetion for the life of me. But now I can just solve them using an AI. But before jumping into heuristics, A* algorithms, and all kinds of solving. 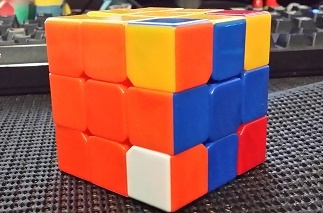 First, let us consider a random Rubiks Cube itself. Is the cube actually solveable in the first place? Can we go from the random state pictured above to a solved cube? The answer is no. The Rubiks Cube parity has been altered! This entry was posted in Portfolio, Programming Gems and tagged ai, algorithm, C++, cpp, cube, gems, portfolio, programming, rubiks, rubiks-cube on November 5, 2014 by Anthony Barranco.